A young boy carries away a box of food from a distribution centre in Afgoye, Somalia. 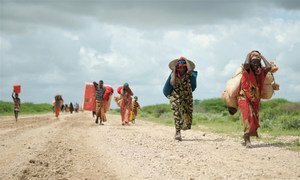 The United Nations envoy in Somalia warned today that despite some political and security gains, the humanitarian situation in the long-troubled country has deteriorated, with more than three million people now in need of assistance, including over one million Somalis who do not have enough to eat. This number is up 20 per cent compared to six months ago, the Secretary General’s Special Representative for Somalia, Nicholas Kay, told Security Council today as he briefed the 15-member body on the situation in the country. By the end of August, twice as many households were assisted per month with food aid. Over 300 metric tons of supplies for tens of thousands of people have been delivered by air due to the lack of secure access to recovered areas. But this falls short of needs on the ground. Air cargo flights simply cannot deliver the quantities required. Secure road access is essential. Echoing Mr. Kay’s warning about the dire situation, UN Humanitarian Coordinator in the Horn of Africa, Philippe Lazzarini, said in an earlier interview with UN Radio that 50,000 children in Somalia could die unless they are given immediate assistance. "We have more than one million people who are in need of urgent assistance. Among them we have 250,000 children. And among them, we have 50,000 children who are on the doorstep of death, if no assistance is provided now," said Mr. Lazzarini. A drought has worsened an already grim humanitarian situation in the country which has experienced more than two decades of insecurity. The Al Shabaab terrorist group has been driven out of a number of cities but has blocked food supply routes in some parts of the country. Mr. Kay today told the Council today that military gains must be consolidated through stabilization. While Al-Shabaab has suffered significant reverses and the political process has moved forward, Somalia’s challenges remain significant. Urgent and coherent action by the Federal Government and international partners is needed in security, development, political and humanitarian fields. And women and youth must participate in the process of reconciliation and the establishment of interim regional administrations. He said he hoped for a “new map” of a federal Somalia by the end of the year. He also called for faster progress in creating two key constitutionally mandated bodies: the National Independent Electoral Commission and the Boundaries and Federation Commission. “I remain particularly concerned about the risk of political in-fighting,” Mr. Kay said, pointing out that twice in the last twelve months this has led to bureaucratic paralysis. Somalia’s political institutions, including the Federal Parliament should focus on establishing the processes that will pave the way to peace and stability. “This parliamentary session will be decisive: if key laws are not passed, Somalis will not achieve their dreams for a new constitution and democratic elections in 2016,” he added. Additionally, human rights remains a major concern, he said, briefing the Council on the recent arrests of journalists, who are yet to face trial, and the closure of media outlets, as well as the increasing use of capital punishment. Somalia’s peace process is “gathering momentum” amid political progress and improving security, United Nations Secretary-General Ban Ki-moon said today, while also warning that there was “much work still ahead” for the Horn of Africa country.